In Venezuela, An Electricity Crisis Adds To Country's Woes : Parallels The country has oil, natural gas and rivers for hydroelectric power. Yet it's suffering crippling electricity cuts, adding to its economic woes. 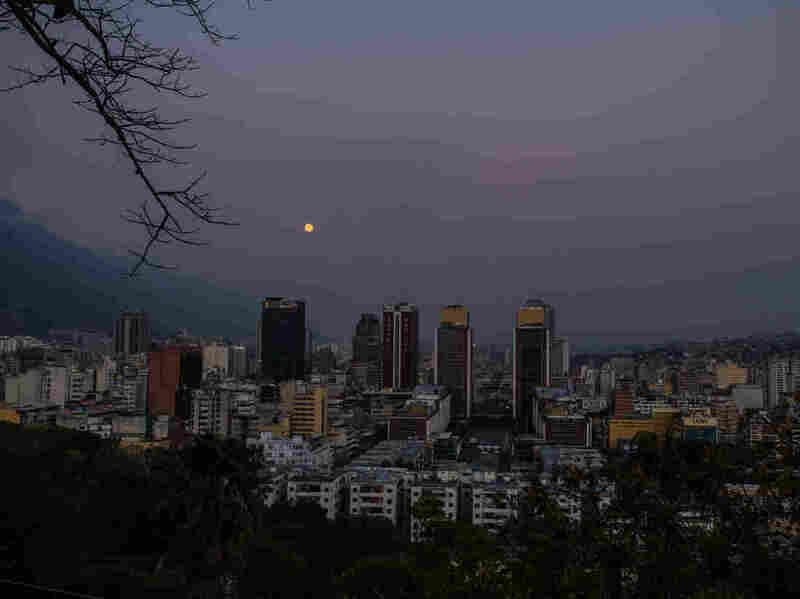 The headquarters of the Bank of Venezuela (from left) and buildings housing the National Assembly and various government ministries stand in darkness in Caracas on March 22. Venezuela shut down for a week to conserve electricity amid a deepening power crisis. At the Caracas Paper Co., founded in 1953, printing presses and cutting machines used to churn out 13,000 tons of notebooks, manila folders and envelopes every year. Now, it produces less than half that amount. That's due to a paper shortage as well as frequent power outages. The blackouts can last up to three hours, says production manager Antonio Lamarca. And they come just as the government is urging Venezuelan businesses to ramp up production and help rescue the economy. "The machinery shuts down. There's no water, so the bathrooms don't work. We have to send the workers home," Lamarca says. Some factories have adapted by installing diesel generators. But paper plant consultant Jose Sotelo says that a generator big enough to keep all these machines running would break the company's budget. Venezuela might seem like an odd place for an energy crisis. It's home to the world's largest oil reserves as well as huge natural gas deposits and massive rivers for hydroelectric dams. But the El Niño weather effect has drastically reduced water levels at the country's main hydroelectric complex. And so now, on top of food shortages and triple-digit inflation, people must put up with power outages. Venezuela's government announced a weeklong holiday last week to conserve electricity. The government, which controls the electric system, accuses unnamed "enemies" — the political opposition — of allegedly attacking the country's thermoelectric plants. "We have to understand, this is a war," Luis Motta, the minister of electricity, declared in an interview on state TV. But independent analysts say government mismanagement and populist policies are to blame for the crisis. For example, Venezuelan households pay just pennies a month for electricity. "For me, if I want to do my monthly budget, I don't even care about electricity payment," says Caracas-based economist Carlos Alvarez. "It is nothing." He says these rock-bottom rates starve the state electric company of money needed to upgrade the system. Now, with Venezuela's economy in a free fall, the cash-strapped government has more pressing concerns, he says. "I would say for now [the] priority is food, medicine," Alvarez says. "People [are] dying because they don't have the medicine that they need. People [are in] lines to get some food." Venezuela's power outages — which have been happening on and off for about five years but became worse this year owing to extremely low water levels in the main hydroelectric dam — are making daily life especially miserable. With no electricity, neighborhood water pumps stop working. To wash dishes and flush toilets, Elizabeth Castro, a nurse, stores water in buckets inside her apartment on the outskirts of Caracas. The standing water provides a breeding ground for mosquitoes that spread malaria and Zika, a disease that has sickened Castro and several family members. "What's happening to us is really alarming," Castro says. But trying to escape from it all — for example, by taking in a movie — is also complicated. At a multiplex in a Caracas mall, the last showing of the movie Spotlight starts at 5:45 in the afternoon. Why so early? Because of power rationing, the shopping center closes at 7 p.m.